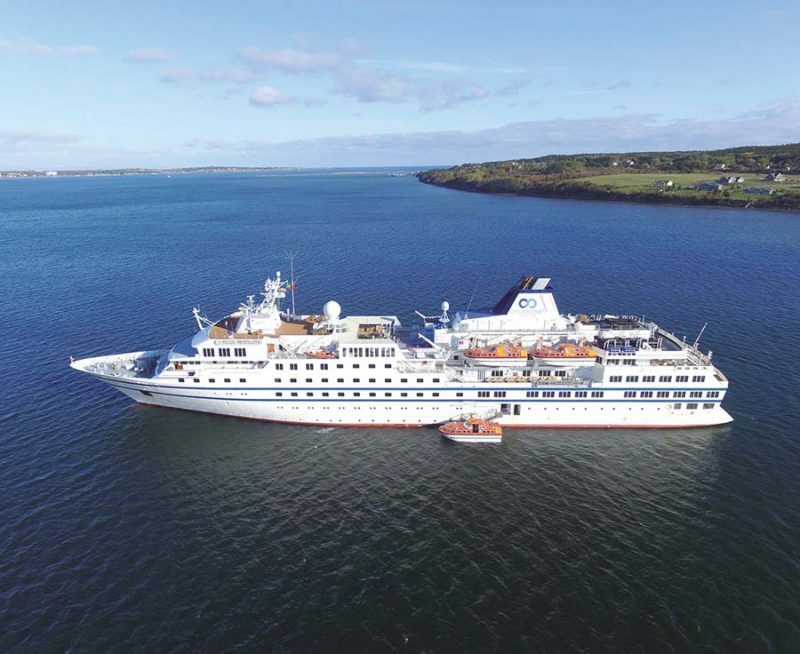 On 18th October One Ocean Expeditions held a recommissioning ceremony at Sydney, Cape Breton Island, Nova Scotia, for the company’s newest vessel, the 8,445gt/1991 built RCGS Resolute (above). The ship was Hapag-Lloyd’s Hanseatic until September 2018. This “new” vessel provides One Ocean with a springboard to further grow the number of sailings to remote destinations in the world, including Canada’s East Coast, the Canadian High Arctic and Antarctica. The ceremony at Sydney was steeped in centuries of old Naval tradition, including a champagne toast by the Commissioner of Nunavut and a blessing of the ship fulfilled by Reverend Canon Donald J Lawton (CD). The RCGS Resolute’s inaugural voyage departed from Ushuaia on 16th November with an “Antarctica – Off the Beaten Track’” itinerary. The RCGS Resolute is also the first in the company’s fleet to carry a custom-built 20ft container laboratory fitted out with state-of-the-art equipment for scientists to conduct their work in the isolated coastal areas explored. The ‘One Lab’ will also be installed on fleet mates Akademik Ioffe (6,450gt/1989) and Akademik Sergey Vavilov (6,344gt/1988), for Spring 2019. On 31st October Fincantieri and fledgling cruise operator Virgin Voyages signed a contract valued at approximately €700 million for the construction of a fourth cruise ship, which will be delivered at the end of 2023. The newbuild will be a sistership to the three already on order with Fincantieri. Construction is underway at the Sestri Ponente shipyard (Genoa) and the initial trio of ships will enter the Virgin Voyage’s fleet respectively in 2020, 2021 and 2022. The fourth vessel will be approximately 110,000gt, 278m long, 38m wide and equipped with over 1,400 guest cabins designed to host more than 2,770 passengers, accompanied by 1,100 crew members. When delivered, the first vessel, Scarlet Lady, will offer Cuba as a destination during her inaugural 2020 season. On 8th November Virgin Voyages revealed details of the gastronomic delights that will be available aboard the Scarlet Lady via an expansive array of restaurants ranging from haute cuisine to casual fare via a total of 20+ food choices. Ponant’s new 150m long polar ice-class ship, Le Commandant Charcot, is being built for Ponant at VARD’s Søviknes yard in Norway and it has been announced that the luxury cruise vessel will be powered by Wärtsilä’s 31 DF dual-fuel engine type. The new hybrid ship is intended to operate in environmentally sensitive Arctic and Antarctic waters, hence she will run primarily on LNG. In addition to four 14-cylinder and two 10-cylinder Wärtsilä 31DF engines, Wärtsilä will also supply the fuel gas supply system, and the company’s Nacos Platinum navigation equipment. The Wärtsilä equipment is scheduled to be delivered in 2020, one year prior to the delivery of the ship. The previous eleven ships are all powered by Wärtsilä engines. The 9,976gt/2018 built Le Champlain was delivered to Ponant in late September and departed VARD’s Søviknes yard on 27th September. The official inaugural cruise departed from Honfleur, France, on 25th October after the ship had been formally christened at the town’s cruise quay on the banks of the River Seine. The 8-day cruise took the ship to Lisbon via Dinard (France), Pasajes and Vigo (Spain) and Leixões (Portugal). In mid-October the third Explorer Class ship, the Le Bougainville, was made ready to depart from the VARD shipyard in Tulcea, Romania, under tow to VARD’s Søviknes yard in Norway for final fitting out ahead of her 2019 delivery date. The vessel (Hull 850) was noted in the Mediterranean off Malta on 22nd October being towed by the 1,374gt/2011 built tug Fairplay-33. On 16th October Carnival Cruise Lines announced a dry dock project that will transform the 101,705gt/2000 built Carnival Victory into the Carnival Radiance. This represents the final phase of a $2 billion fleet enhancement programme that has produced a consistent level of on-ship facilities such as the WaterWorks aqua parks, specialty dining, entertainment, enhanced accommodations and amenities. The refurbishment of the Carnival Victory will add the company’s popular culinary, bar and entertainment innovations and completes the “any ship, any port, any itinerary” fleet enhancement programme that commenced in 2011 across the fleet of 26 ships. Following a 38 day dry dock in Cadiz, Spain, the Carnival Radiance will enter service in 2020. The Homeport and itinerary details for the new look ship were to be announced in mid-November. Since 2011 Carnival has completed refurbishments on over 20 ships, taken delivery of three new ships and has three additional ships scheduled for delivery through to 2022. Since the process began, Carnival’s annual passenger count has grown from 4.1 million to 5.2 million guests. The number of children under 18 sailing annually has grown from 650,000 to 800,000, its employee base has grown from 34,000 to 40,000, its voyage operations have grown from 1,400 to 1,700 sailings per year and its lower berth count has grown from 58,000 to 70,000. As Carnival completes this phase of the capital investment and fleet expansion programme, it is now focussing on providing a better onboard technology experience for guests. The Carnival Hub App is now available on all 26 ships in the fleet and running ahead of projections with regard to customer adoption. The enhanced NextGen connectivity system has proven extremely successful on Carnival Horizon and Carnival Vista, enabling fast and reliable Wi-Fi at sea. The Carnival Radiance will also receive technology. The company is also piloting a “pizza anywhere” delivery capability on select vessels with the eventual goal of allowing guests to order food and drink options directly from the Hub App for delivery to their location on board!